The Vineyard Gazette - Martha's Vineyard News | Stuff this! The Thanksgiving feast is really about guilty pleasures. Sure, every year there’s an attempt to add healthy things like crunchy salads, roasted vegetables and sautéed greens. But what everyone is really looking forward to are the special dishes that you generally only eat (and cook) once a year. They tend to be a bit caloric and they take some time to make, but that’s okay. It’s Thanksgiving, and it’s all about the rich, silky gravy, the green bean casserole, the spicy-sweet pumpkin pie, the zesty cranberry sauce, and of course the stuffing. Making a meal with all of these delicious components requires planning, shopping, and lots of prep, followed by a full day in the kitchen chopping, stirring, baking and smelling the spices unique to this holiday. It isn’t quick and easy, but it is a labor of love. While you can’t go too crazy changing up family favorites at holiday time, it is fun (especially for the cook) to add a twist or small change to one of last year’s recipes. An easy way to do this on the Vineyard, with the lasting fall growing season, is to look to the local harvest for some creative choices. One item I like to change up slightly each year is the stuffing, depending on what I find at the fall farmers’ market. I always use my recipe for Linguiça stuffing from my cookbook Vineyard Harvest as a base. I swap out ingredients, bread types, veggies and meats, but the measurements and ratios remain pretty much the same. 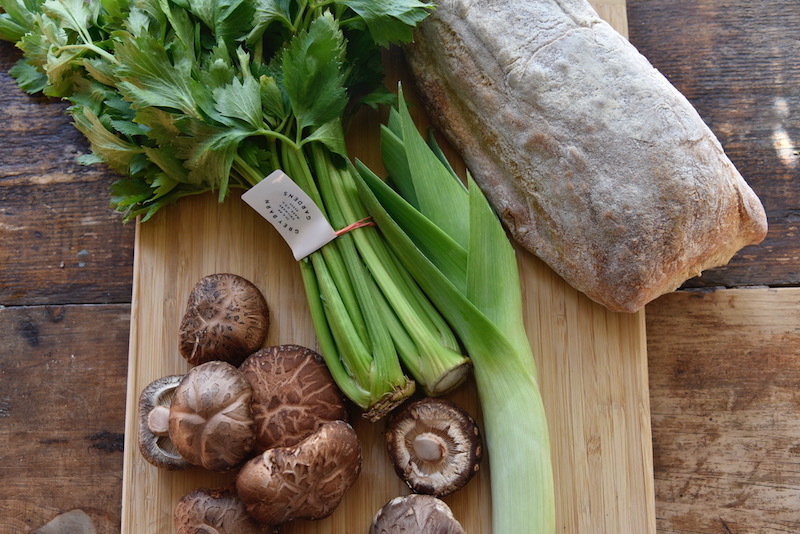 This year I used the abundance of shiitake mushrooms grown on Martha’s Vineyard as my inspiration. Right now I’m also seeing a lot of beautiful local leeks, and I love to use them in all kinds of dishes but especially stuffing. I also found local celery at the the Grey Barn farm stand. 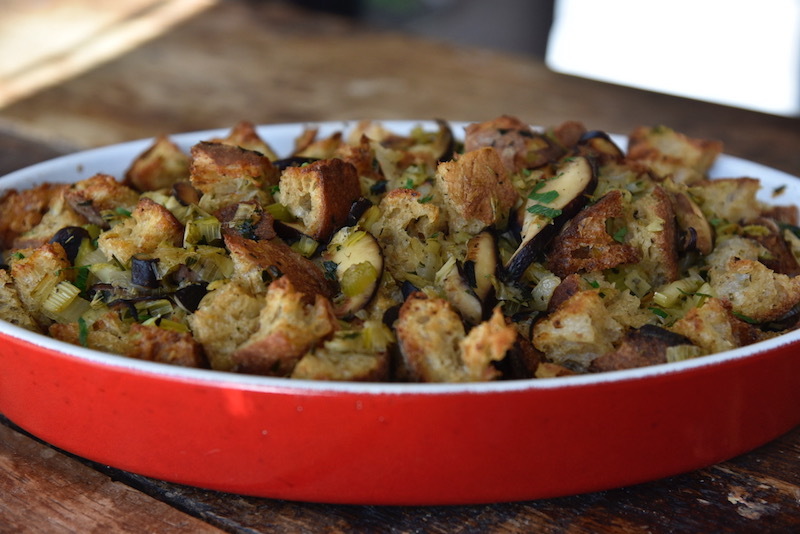 And I decided to add some tang to this year’s stuffing by using sourdough bread. Stuffing styles can vary a lot, and we all have memories of what we grew up eating. Some stuffings are almost like custard—very soft with finely chopped ingredients. Others can be chunky, bready and even dry. My stuffing recipe is a bit of both. It’s my tried-and-true formula and it holds up in the bird or in a pan. Tina Miller is a West Tisbury-based chef, writer, and entrepreneur. She is the author of the cookbook Vineyard Harvest . 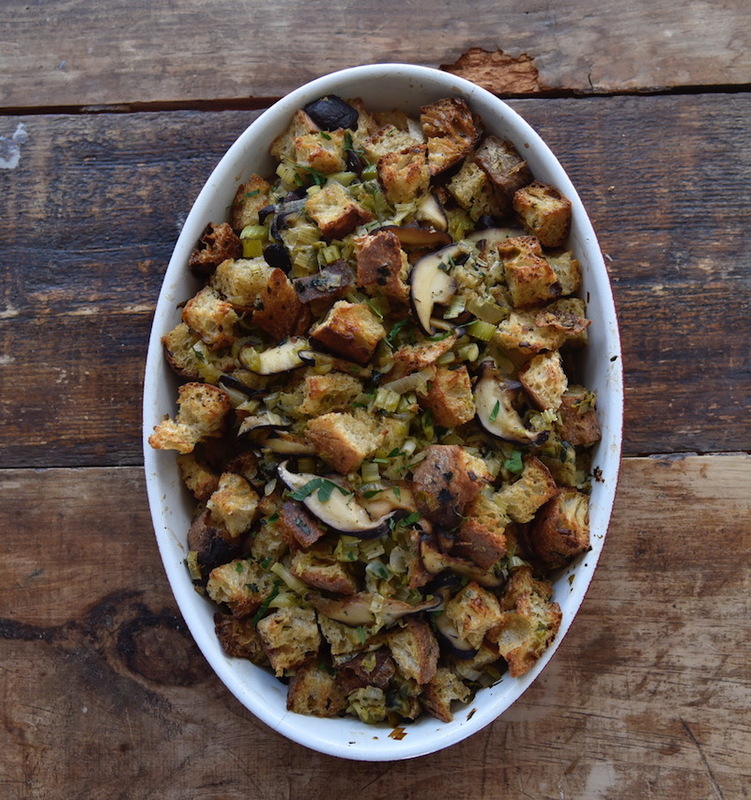 This stuffing is delicious and easy to make even when there isn't a holiday meal on the horizon. Try it alongside roast chicken or roast pork. 1. Preheat the oven to 350 degrees. Spread the bread cubes on a sheet pan and bake them for about 20 minutes or until crisp throughout. 2. In a large saucepan, melt the butter over medium heat. Add the mushrooms and sauté, stirring occasionally, for 4 to 5 minutes or until softened and somewhat shrunken. Add the leeks, celery, onions, parsley and rosemary. Cook for 10 to 15 minutes, reducing the heat if necessary and stirring occasionally, until the vegetables are softened but not browned. Add salt and pepper to taste. Don’t be too conservative; the bread will absorb a lot of seasoning. Add the chicken broth. Bring just to a simmer and remove from the stove. Let the mixture cool slightly. 3. Put the bread cubes in a large bowl. Pour the vegetable and broth mixture evenly over everything, stirring and tossing at the same time if possible to make sure the liquids are evenly distributed and that one area isn’t softer than another. 4. Let the mixture cool, tossing occasionally, before stuffing your bird. Put any extra (or even all of it) in a baking pan and bake it separately (until warmed through and the top is brown) when the time comes.